Osteoarthritis (OA) is a degenerative disease that affects the cartilage of joints. Cartilage is a firm, flexible connective tissue that lines the surface of many joints and provides shock absorption and cushioning for the bony surfaces of those joints as they move. During the process of OA, cartilage gradually begins to break down and is worn away. This means that the bony surfaces below the cartilage start to rub together, creating increased stress and friction. The body reacts to this increased stress by creating small bony deposits around the joint, as more of these are created the joint becomes increasingly painful and difficult to move. 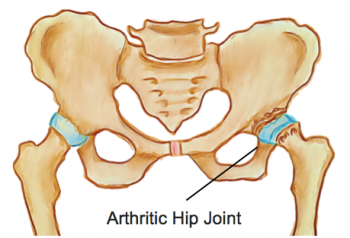 The hip is one the joints most commonly affected by osteoarthritis. While OA is generally considered to be a disease associated with aging, younger people can be affected, particularly following trauma to the hip. As a general rule, however, the cartilage in our bodies loses elasticity as we age, making it more susceptible to damage. Other risk factors for the development of OA are a family history of OA, previous traumatic injury of the hip, obesity, improper formation of the hip at birth (developmental dysplasia), genetic defects of the cartilage, impingement of the hip (femoroacetabular impingement) and a history of intense weight bearing activities. Treatment will also include stretching, trigger point therapy, joint mobilization to increase the joint's mobility, and a personalised exercise program, including hydrotherapy and isometric exercises that work to increase muscle strength while putting less pressure on the joint.